December issue on sale today! | What Hi-Fi? December issue on sale today! It's not quite Christmas, but our December issue hits the shops today. And it's packed with goodies to put on your wishlist for Santa. Mindful that household budgets are tight right now, we've picked plenty of affordable kit for you to choose from. The standard earbuds that come with most portable players and smartphones are usually pretty rubbish, but we've found plenty from just £30 that will give your MP3 player or mobile a sonic boost in our in-ear headphones test. Looking for a new DAB/FM radio? We've rounded up six of the latest models from £70, including offerings from Pure, Roberts, Sony and John Lewis. And if you like to take your music out and about with you, check out or round-up of ten affordable MP3 players, from a budget £25 up to £115 for Apple's iPod nano. Sticking to the budget theme, we've First Tested an affordable new Blu-ray player from Toshiba, a dinky surround speaker package from Boston Acoustics, Sony's CMT-G1BiP micro system, a midrange 37in TV – also from Toshiba – and Orbitsound's T12v3 soundbar/iPod dock. Looking to the future, music streaming is fast becoming the new hi-fi, and to that end we've put together a very different Supertest this month. Rather than take individual components and compare them against each other, we've selected ten top-notch systems across all methods and price points to enable you to stream your tunes around your home. From simple AirPlay solutions, to modular multiroom from Sonos, a networked micro and affordable separates streaming hi-fi to state-of-the-art wireless systems, we've got a set-up to meet your budget and needs. For those looking to invest in a new all-in-one home cinema this Yuletide, we've rustled up a four-way Group Test of Blu-ray systems from LG, Panasonic, Samsung and Sony. With prices from £450-£700, a cracking Blu-ray system is well within reach. Over in our First Tests section, there's plenty more hi-tech new kit to whet your appetite. Our lead review puts Sony's iPad-rivalling Tablet S through its paces, plus Apple's new iPhone 4S gets a thorough shake-down, along with Bose's Soundlink Wireless Mobile speaker and Optoma's entry-level HD33 3D projector. Those of a more traditional disposition can feast their eyes on Acoustic Energy's new Reference 1 stereo speakers, a new Origin Live turntable, Epoz Aktimate Micro powered speakers, NAD's DAC1 wireless DAC and Tivoli's Audio PAL+ DAB radio. Naturally, we haven't forgotten our regular TV viewers, and if you haven't yet made the switch to digital, our Group Test of Freeview HD TV recorders is just for you. These simple add-on boxes will turn your TV into a slice of high-def heaven, and with their smart PVR (personal video recorder) functionality, you need never miss your favourite TV show again. Prices start from £250. Finally, no issue of the magazine would be complete without our Temptations section. This month Naim's SuperUniti media player and the gorgeous Dali Fazon F5 floorstanding speakers are under the spotlight. 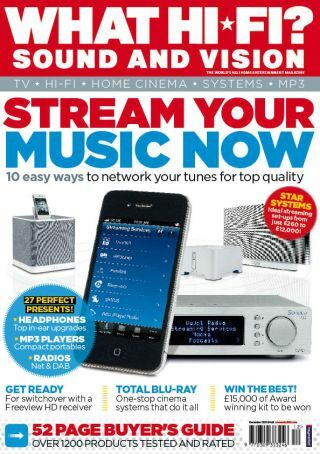 All this and more is packed into the December issue of What Hi-Fi? Sound and Vision, on sale now. And don't forget you can download the digital edition to your PC or tablet too.